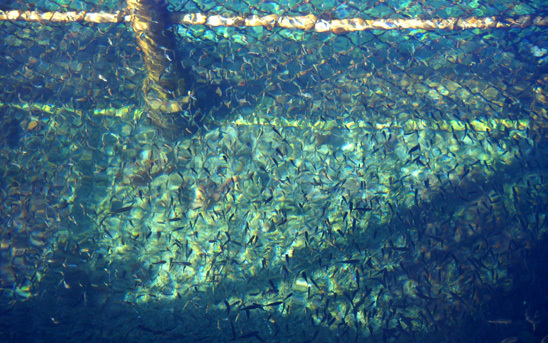 "San Solomon Springs has provided water for travelers for thousands of years. 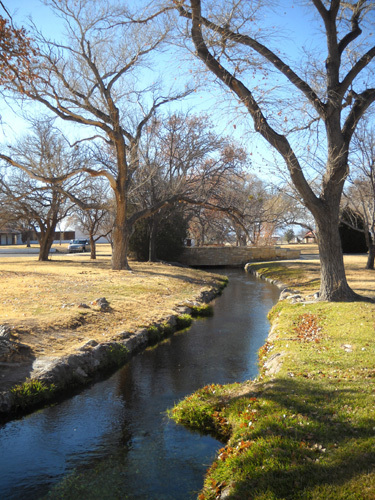 Artifacts indicate Indians used the spring extensively before white men came to the area. 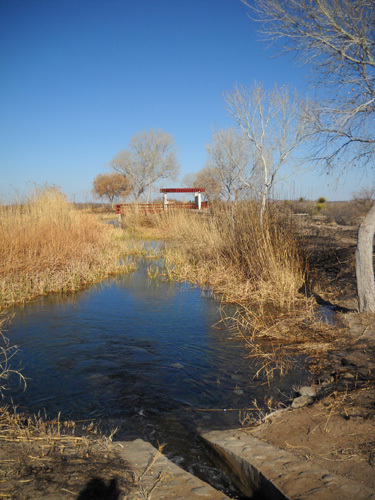 Mexican farmers who used the water for their crops and hand-dug the first irrigation canals." 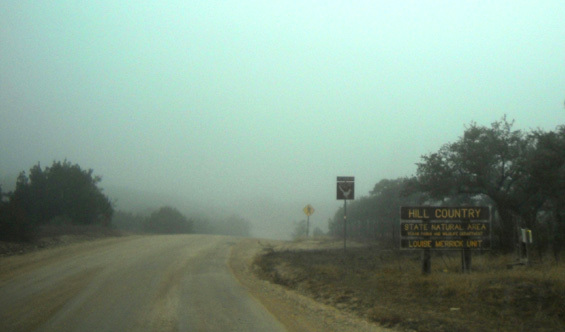 Our next destination is another state natural area, this one near Bandera, TX a bit west of metro San Antonio. We decided to break up the drive from Patagonia, AZ into three travel days, stopping the first night in Las Cruces and the second night at Balmorhea State Park in western Texas. The park is located just a few miles south of I-10 between exits 192 and 206, not far from the western end (beginning?) of I-20. 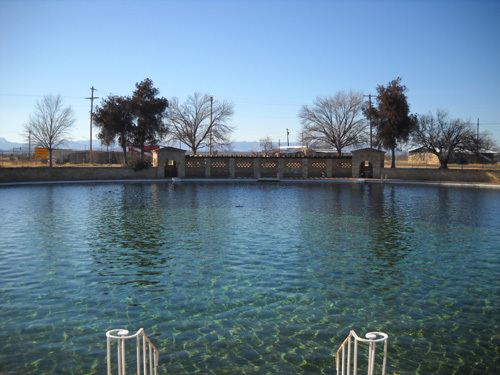 It is named for the nearby town of Balmorhea. Texas has a very handy 112-page 6x9-inch state park guide with a representative color photo and description of each of its parks and historical sites. For someone like me, it's kind of a "wish book." We've been pleased with the Texas state parks we've already visited and we'd like to see more of them as we travel through the state. Balmorhea is so special that it rates two photos and an entire page in the guide! The photos and description of this unique park caught my attention and I said, "Why not?" This trip back to south central Texas was the perfect opportunity to check out Balmorhea since it was so easy to access from the freeway. 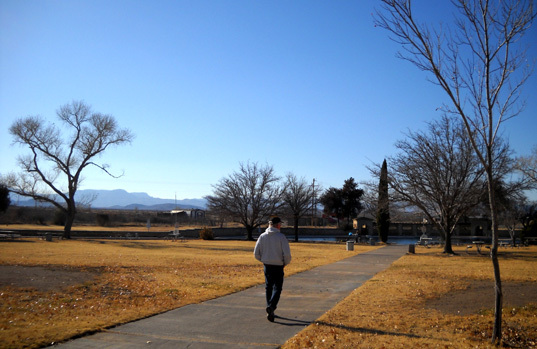 Jim heads toward the spring-fed pool; the Davis Mountains form a backdrop. 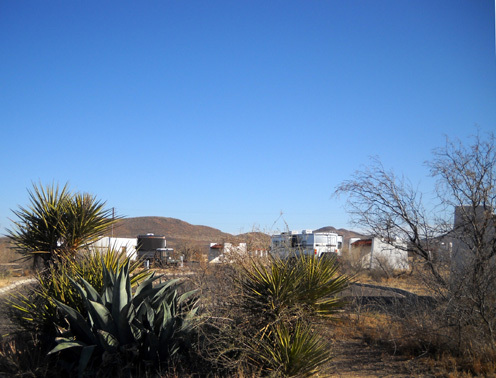 Bottom line: we plan to go back someday to camp, swim, and possibly use the park on our way to-from the Davis Mountains and Big Bend Country to the south. One afternoon was not enough time to thoroughly enjoy the small (46-acre) park, let alone see any other sites. What could be better than diving into a warm (72-76�F. 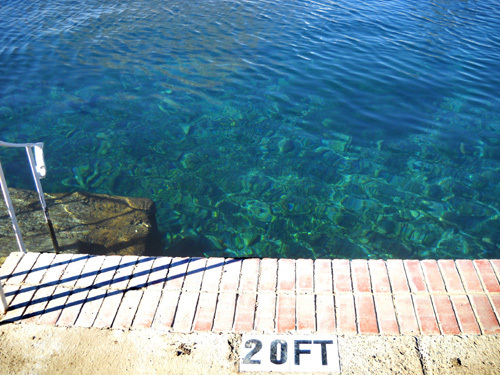 year round) spring-fed swimming pool on a cool but sunny day in January? 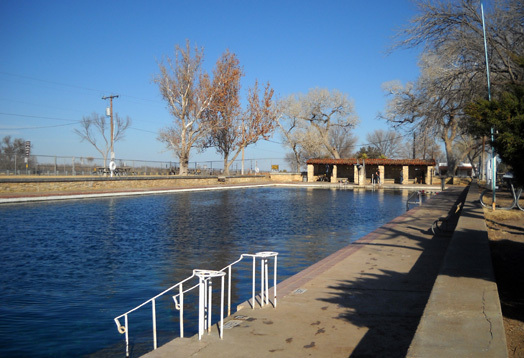 Balmorhea State Park is built around an artesian spring that is large enough to naturally pump out between 22 and 28 million gallons of water every day (about a million gallons each hour), constantly replenishing a huge (77,053 square foot = 1� surface acre) W-shaped pool that is deep enough for scuba diving -- 25 feet in the deepest part. It is billed as the world's largest spring-fed swimming pool. The pool is man-made; the water filling it flows through naturally. It gets even deeper than this! This is not your grandma's ordinary concrete-and-tile pool, either. 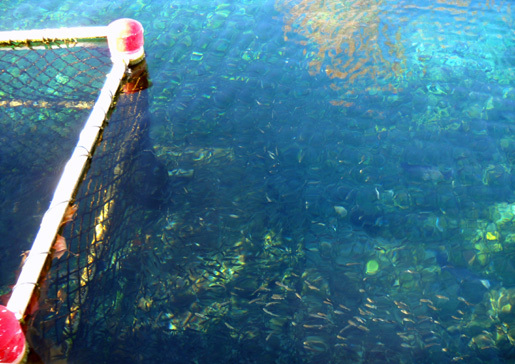 The deep end, beloved by scuba and skin divers, has a gravel floor with aquatic plants and thousands of fish!! That's where the spring empties into the pool. Very, very cool (as in "kewl," not chilly -- the water is nice and warm in the winter). We were totally fascinated with the whole set-up. We've enjoyed natural hot springs in several places in Colorado and Montana, both commercial and in the wild, but have never seen anything quite like this. A young man carries his scuba tank into the pool area. 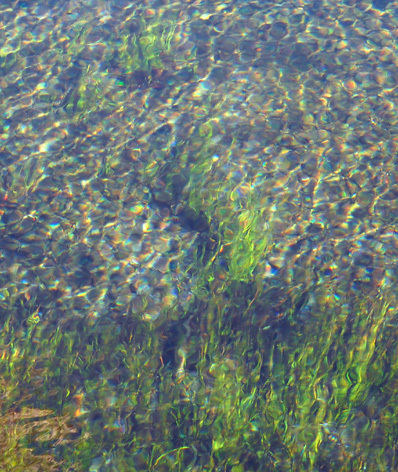 Close-up of gravel and aquatic plants at bottom of canal; there are fish, too. and out of the park for another 3� miles, where they empty into Balmorhea Lake. 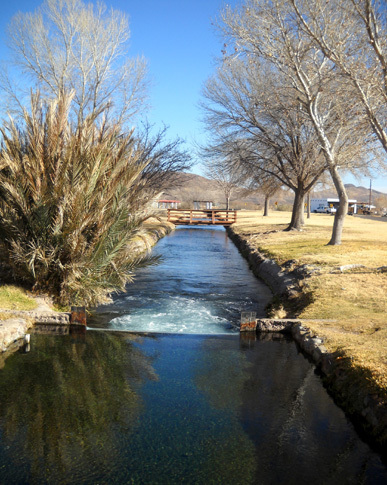 The springs provide irrigation to local ranches between the park and lake. The park is probably crowded on weekends. In the middle of the week in January, however, fewer than ten young men and women were swimming and scuba diving and two-thirds of the campsites were empty (above). The air was too chilly for us to want to jump into the water but we had a great time wandering around the park oohing and aahing and taking pictures. No, Cody-Lab didn't get to jump into the pool, wetland pond, or canals -- but he sure wanted to! In addition to the paragraph I quoted at the top of the entry about the early history of the spring, the park website offers more interesting historical data from the last century. 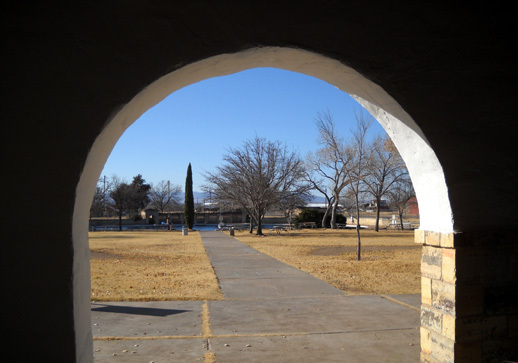 Balmorhea State Park was constructed by Company 1856 of the Civilian Conservation Corps (CCC) between 1936 and 1941. 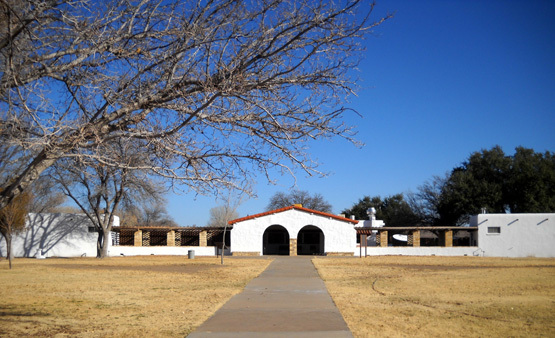 In addition to the huge pool, the CCC constructed most of the buildings in the park: a limestone concession building, two wooden bathhouses, an adobe superintendent residence, and the historic rooms in the adobe brick San Solomon Courts. 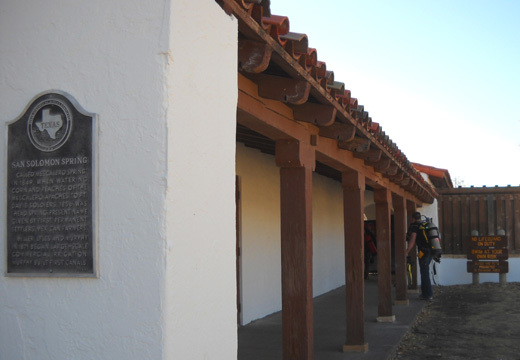 All of the CCC buildings are constructed in Spanish Colonial style with stucco exteriors and tile roofs. The lobby of the park office includes several photographs of the CCC at work in what officially became Balmorhea State Park in the 1960s. It is interesting to compare pictures of the park property from the late 1930s with the present. 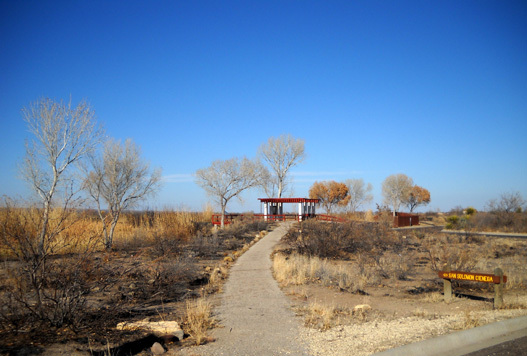 "Balmorhea State Park is a substantial monument to the construction skills and hard work of the CCC crew and their supervisors," the website asserts. Indeed it is. I am always impressed when I see structures remaining in state and national parks today, over seventy years later, that were painstakingly built by these industrious men and women, everything from magnificent log lodges to rustic wooden furniture to adobe visitors' centers to this amazing pool to remote roads to long bridges spanning yawning gaps to mossy retaining walls along the Appalachian Trail . . . there was virtually nothing these people couldn't build -- and they built them to last for generations of Americans (and visitors) to enjoy. 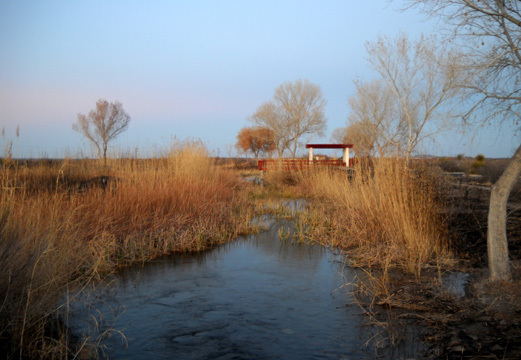 I learned a new Spanish word: a ci�nega (or ci�naga) is a desert wetland or marsh. 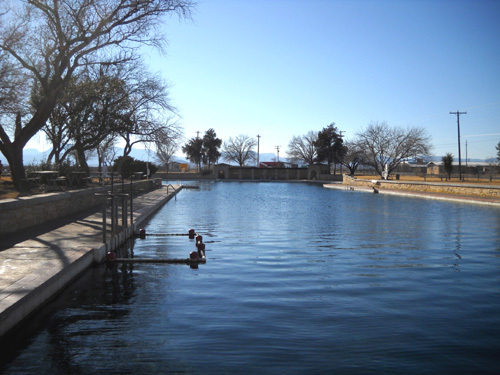 San Solomon Springs was once surrounded by an extensive ci�nega that was destroyed during the construction of Balmorhea State Park's swimming pool in the mid-1930s. 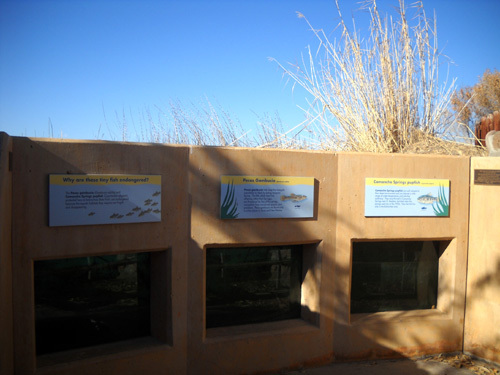 Fifteen years ago the Texas State Parks & Wildlife Department re-created a three-acre ci�nega near the San Solomon Courts and campground to provide critical habitat and help prevent the extinction of two rare and endangered desert fishes, the Pecos gambusia and the Comanche Springs pupfish, which lives only in the Balmorhea area. 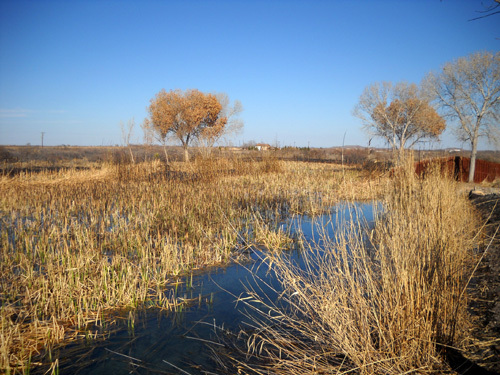 Construction is also scheduled soon for a new wetland area; clearing has already begun and will affect some visitors to the park this spring and summer. I enjoyed walking around the small ci�nega at all times of day, especially in the late afternoon (below) and early morning when the sun was lower in the sky and cast long shadows across the water. 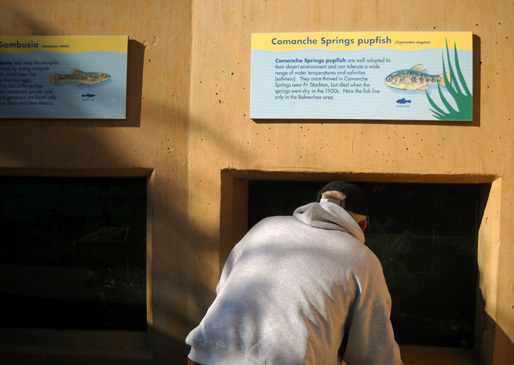 The wetland is fed by the spring and draws numerous birds, amphibians, reptiles, and mammals. Otherwise, we thoroughly enjoyed the award-winning ci�nega and hope the new one is completed by the time we return to the park in another year or two. Entry into the park was free with our Texas State Parks Pass. The entry fee for visitors over age 13 without a pass is $7/day, the highest we've encountered so far in a state park in Texas. I'd guess that's because use of the pool is included. Lodging in one of the eighteen rooms in the historic San Solomon Courts currently ranges from $60 to $80 per night, depending on the number of beds and whether the room has a kitchen. Those prices sound reasonable. We haven't seen inside the rooms but they are very attractive from the outside. Camping fees range from $11 for a site with water only to $14 (water and electricity) to $17 for water, electricity, and cable TV hook-ups. None of the sites have sewers but there is a dump station. About ten of the thirty-four camping sites were taken overnight by folks camping in everything from tents to big Class A motor homes (above). Check this web page for current fees in the park. 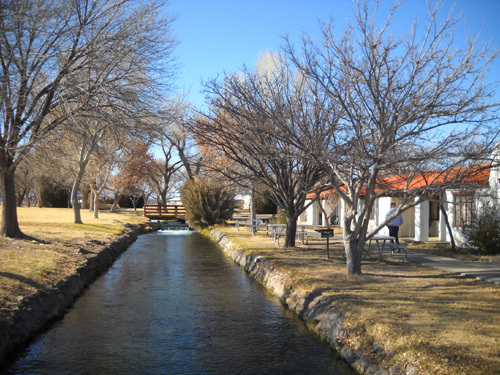 We got only a little taste of what this area has to offer in our brief overnight stay at Balmorhea State Park. In the future we'd like to explore the scenic loop around the Davis Mountains south of Balmorhea, including Fort Davis National Historic Site, Davis Mountains State Park (another TX state park with a campground), Davis Mountains Indian Lodge, and the famous McDonald Observatory. A "star party" with access to the giant telescopes sounds like fun! There are also several museums, wineries, and other attractions that would keep us busy for several days down there. And then there are the Big Bend National Park and Big Bend Ranch State Park even farther south . . .
After one last hike this morning around Balmorhea's beautiful ci�nega, canals, and pool, we drove to the Hill Country State Natural Area near Bandera, TX, about an hour northwest of San Antonio. This natural area is another site within the Texas State Park system. Traffic moved well on I-10 and the secondary roads we traveled at either end of the journey, although we don't even try to keep up with the 80 MPH speed limit on the freeway in remote areas of the state; that would be insane hauling a seven-ton "fiver." We usually go about 65 MPH to conserve fuel, sometimes edging up to 70 MPH if the road is fairly flat. As we approached the Hill Country region east of Junction, TX, we slowed 'er down a bit. 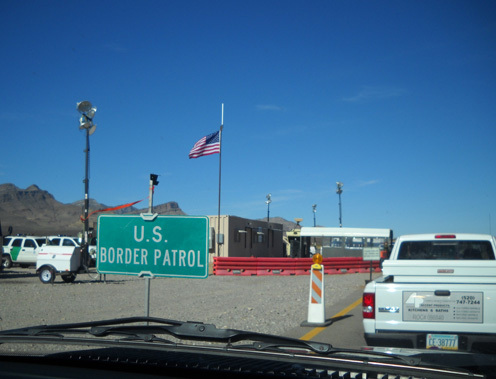 We had to stop for another U.S. Border Patrol check-point about a hundred miles into Texas on west I-10. (The one shown above is in Arizona.) Guess we don't fit their profile for folks smuggling bodies or drugs into the country; no one in AZ, NM, or TX has ever wanted to inspect our truck or RV. The most the agents have done is ask where we are headed. Usually they just wave us through. By the way, much as we like to joke we never kid around with the Border Patrol, customs agents, or security guards at military installations. That's a good way to get detained. At least it's not down to freezing yet; before the sun went down, it was 51�F. We've been nervously eyeing the weather forecasts for the next few days, when it's supposed to get into the low teens here -- highly irregular this far south in Texas! An arctic air mass is slowly inching southward, reeking havoc over much of the country on its way south. We'll be camping in this large, mostly undeveloped natural area through the weekend to help Joe Prusaitis & Company pull off the Bandera ultra trail events. This year's event has about 600 runners participating, which is a lot for an ultra. In the next two entries I'll show photos from the race and whatever trails I'm able to hike this week.